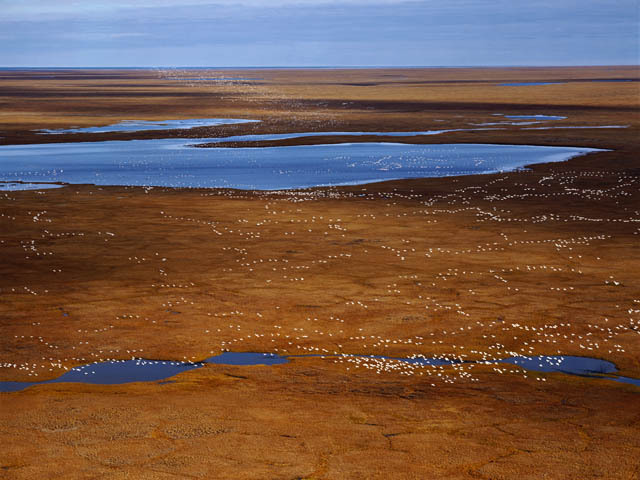 Nearly 300,000 snow-geese arrive from their nesting ground in the Canadian high Arctic to the coastal plain of the Arctic National Wildlife Refuge in early autumn. They feed sixteen hours a day on a type of cotton grass to build fat before they start their long migration south to places like New Mexico (my home), California, Texas, and Mexico. During spring and summer months nearly ninety species migrate to the coastal plain from all six continents to nest and rear their young, to molt, to stage, and to feed. In my mind through migrations of these birds, Arctic National Wildlife Refuge gets connected to every land and oceans of the planet. For several decades, the United States Government has been pushing hard to open up this coastal plain to oil and gas development.